Despite your best efforts it’s not always possible to have a clean – and clean-smelling -pooch. Yes, you have a regular grooming and bath routine but what can you do in-between when his coat dirt and whiff gets a little too much? One easy-to-use option is to cut out the water and go dry. Dry dog shampoo is a neat way to nip the grime and smell in the bud when you need to clean your dog on the go. With a squirt of powder or mousse, waterless shampoo can absorb excess oil, dirt and odor to tide your pet over until it’s time for his next bath. 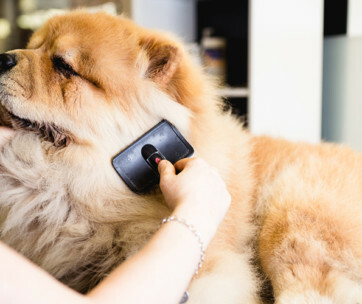 Dry shampoos are not meant to replace his regular grooming routine, but as a quick pick-up, they can help to keep both your pet and his human happy. We take a dip into the best dry shampoos for dogs so you can choose the perfect ‘shake and go’ waterless dog shampoo for your furry friend. Go natural with this fresh-smelling waterless dog shampoo from Wahl, that comes in an easy to use foam wash that requires no rinsing. Using coconut lime verbena and PH balanced, this is a well-priced dog shampoo that is also alcohol and paraben-free so kind on both your dog’s skin and on your purse. 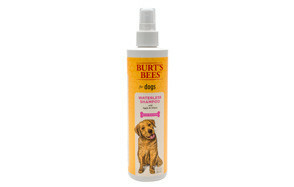 We love the smell and also its moisturizing properties that leave your pooch’s coat refreshed and soothed. This is not a powder dry shampoo – the pump action creates a light foam that you massage into your dog’s coat for a nice, deep clean. Then simply brush away the residue and leave to naturally dry and you get a sweet-smelling pooch with a suitably spruced up coat to match. A great product that scoops our Best Choice top spot in our best dry shampoo for dogs list. Whether it’s for a quick spot clean or a full-body cleanse, this waterless dog shampoo from Bodhi Dog has also been formulated to keep even the most sensitive of pets happy. Super-gentle on the skin, this effective dog shampoo is 100% detergent, paraben and alcohol-free and contains no harsh chemicals that will irritate your furry friend. And the gentle lavender scent will have him smelling like a top-dog in no time. You feel as if you are doing a thorough clean when you use this dry shampoo for dogs even though it is quick and easy to use. Simply spray the powder over the offending dirty areas (or the whole dog! ), leave to stand for one minute and then rub your pet down with a towel. When air dried, brush the coat out to reveal a fresh, smooth and luscious shine. Pop this into the back of the car or in the cupboard and it will soon get a reputation for your clean up go-to when your pooch is looking less than his best. 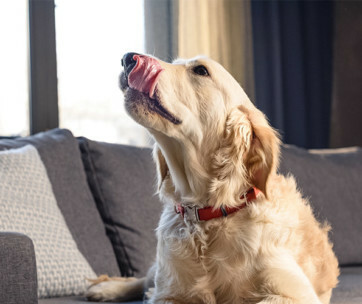 To tackle those stubborn odors, check out this no rinse foam mousse from Paw Choice which is impressively effective in deodorizing those nasty whiffs away. With a natural and moisturizing formula based on coconut and no harsh chemicals, the mousse is also kind to your pooch’s coat and skin so in our books, this is a win, win! Plus, is it safe to use with your topical flea treatment. One of our best waterless dog shampoos, it comes in a pump bottle, so little is wasted, and it is particularly good for older dogs or when you and your pet are out on a road trip and you need to keep everything fresh. With its rather tasty mango and pomegranate smell, you pump the mousse in your hand and rub into your dog’s coat, spreading evenly to massage before allowing to dry. Then brush off any residue for a refreshed and sweeter smelling pet. This dry bath for dogs is also safe for sensitive skins. If you have a young pup that can’t help but get a little stinky, then this super-gentle and PH-balanced dry shampoo spray from Burt’s Bees is your new best friend. Easy to use and made with only natural ingredients, this puppy dry shampoo spray will not irritate the little one’s skin but will be enough to tackle stubborn smells and muck on their coat, to keep them clean and refreshed to keep playing as only puppies can! Using skin-nourishing apple and a lovely shine-boosting honey, it has all the natural ingredient credentials you would expect from the Burt’s Bees brand and is suitable for all pups as well as adult, but just as mucky, dogs. It is also gentle enough to be used every day. Spray directly onto the coat and let dry, before wiping any excess off if needed. 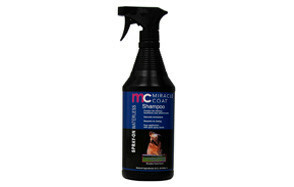 This waterless pet shampoo also leaves their coat with a lovely shine and smell. It also has a calming influence if you pooch’s skin is irritated and itchy. This a dog shampoo that is great for on those on-the-go, quick clean moments when there’s no chance to give your stinky or dirty pooch a full-on bath. Really easy to use and in a handy-sized soap foam dispenser, it’s also good for sensitive skin and can be safely used alongside topical flea and tick treatment. With coconut and pomegranate formula, this is one of our best waterless dog shampoos that won’t dry out your pet’s skin and will leave them with a pleasant and natural smell to keep you sweet. As a waterless dog shampoo, it is also effective in absorbing excess oil and dirt in your dog’s coat. For quick touch ups in-between baths, this is a good value dog dry shampoo to add to your collection. If a spray is your preferred dry shampoo rather than a mousse, Pawstruck have come up with this effective yet gentle formula that enables you to get a quick all-over coverage of your dog’s dirty coat. This dog shampoo has a lovely citrus scent and has a balanced formula that is suitable for all skin types, fur lengths and dog breeds. Plus, its cooling spray effectively calms and soothes itchy, dirty skin. And not only does it do a good coat clean up job, it deodorizes too. It only uses natural ingredients, so ginger, rosemary and bergamot also make the impressive ingredient list. 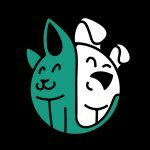 Perfect for between trips to the groomer, and for who dislike bathing, Pawstruck’s dry dog shampoo can be used on your pet’s entire body including his or her face and paws. And what we particularly like about this waterless pet shampoo is its gentle formula is kind to the environment – as it is cruelty free, non-toxic and comes in recyclable packaging so ideal for young pups too. At the top end of our best dry shampoo for dogs review budget, this is a lovely, lux dog shampoo that overall delivers on its ‘miracle coat’ promise. In a solid, easy spray bottle, this dog shampoo uses pharmaceutical grade, natural ingredients specifically chosen to not only clean but to enhance your pooch’s coat and condition. Made with tea tree oil, hyacinth, clove, and vitamin E, this all-natural formula requires no rinsing and leaves a pleasant ‘meadow-fresh’ scent. This waterless dog shampoo can also be used to alleviate minor irritations and skin conditions. Miracle Coat Dog Shampoo does require some effort on your part, as it is not a simple case of spray and leave but with a shiny coat, the time is worth it. You need to spray on then massage into a lather before towel drying and brushing out. You can also choose to add Miracle Coat’s leave in ‘Lusterizing Spray” for that extra gloss. With its ‘spray and leave’ total convenience, we really like this fresh-smelling waterless dog shampoo from Lillian Ruff. And, with its natural coconut and lavender base, it works pretty well to keep your canine’s coat in a healthy condition between full-on baths. This dry bath for dogs is very easy to use – simply spray on to your dog’s fur then work it into their coat with your hand and leave to dry. Hassle-free for both you and your pooch, this also makes our best waterless dog shampoo list thanks to its super moisturizing properties. Free of all those artificial nasties, it is also gentle on their skin and can be safely used alongside topical flea or tick treatment. And its no-nonsense application makes it an ideal choice for the more nervous or ‘bath-phobic’ pet that desperately needs a freshen-up. Vet Recommended Waterless Dog Shampoo is a dry clean powerhouse when it comes to the muckiest and smelliest of pets. Quick and easy to use – simply spray all over their coat, wipe then allow to dry – as a dry shampoo it effortlessly mops up dirt and neutralizes whiffs when a full bath is not possible. This is a great product to have in your bag for after long walks when you don’t want a mucky pooch stinking out your car. With a quick spray and wipe with this waterless pet shampoo and you have a clean and fresh dog that has a pleasant and subtle apple fragrance. The spray nozzle is a tad on the noisy side so could spook a nervous pet on first use, but the spray is super-gentle on your dog’s coat and won’t strip his fur of oil. It can also be used alongside flea and tick treatments so makes it a good dry bath for dogs when you and your pet are on the go. A little goes a long way with this mousse dog shampoo from Paw Choice that effectively cleans as it mops up those unpleasant dirty dog odors. It’s quite a moist product, so not totally dry but it works as well as the powdered varieties in sipping up the oil, dirt and smells that cling to your pooch’s coat. The ingredients in this waterless dog shampoo are gentle on your pet’s coat too – a coconut base with no harsh chemicals, sulfates, alcohol or parabens to keep their fur moisturized, smooth and happy. And the mousse formula works to remove the bacteria behind your pooch’s dirty odor rather than simply masking it with a fragrance. To apply, you pump the dog shampoo into your hands and then work it across and into your pet’s coat before leaving to dry. And there is no need to brush or wipe away any surplus, meaning it will continue to condition their coat until you get the chance to pop your dog in to their regular, full bath. If you can, go for a dry dog shampoo in a spray bottle as keeping a fast-moving pooch clean is difficult enough! With a spray bottle you can make sure you can accurately cover more of your dog’s body with less effort…or mess. It’s important to get the right waterless dog shampoo product for your pet, especially if they have any allergies or skin conditions. Check the package to see what it’s best suited for and if in any doubt, go for a product that is suitable for sensitive canine skins or clearly states it is suitable for all skin types. A mild formula is also the best product to opt for if you are going to be using your dry dog shampoo on a regular basis as anything harsher can strip your dog’s coat of natural oils and dry his skin out. Make your dry bath for dogs work harder by opting for a product that also contains skin nourishing properties. Make sure you go for natural conditioners such as coconut or aloe vera so you don’t actually irritate the skin. Your pet’s skin has a specific PH level and this needs to be kept balanced. Choose a waterless dog shampoo that has been formulated to keep this PH level exactly where it needs to be. While dry dog shampoo is not meant to be a replacement for a regular bath for your mucky dog, they can be used as a freshen up if your pooch is smelling particularly ‘ripe’. Look for a dry shampoo product that can also work on those odor-causing bacteria so you can keep him fresh for longer between his regular full grooming sessions. Make sure your waterless dog shampoo won’t interfere with your pet’s regular topical flea treatments. Check the label to ensure it won’t dilute any topical treatment’s effectiveness. 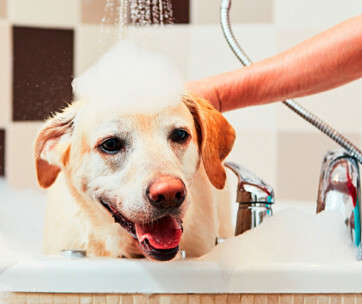 As any dog owner will know, a full bathing session can be a time-consuming and messy task, especially if you have a particularly furry or large pet. So, while a full clean is essential to your pet’s regular grooming routine, a dry dog shampoo is ideal for those mucky moments in-between. Dry shampoo can help to eliminate grease, dirt and odor from your pet’s hair and can be used on the go while out and about, particularly at the end of a wet, muddy or dirty walk. 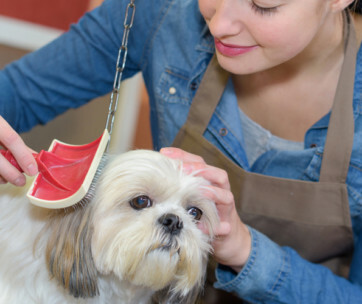 Dry shampoos can also help if you have a dog that can become aggressive or anxious when faced with a full-on bath, reducing the number of baths your pooch could need and so reducing the stress for everyone involved. A waterless dog shampoo can also help to keep his fur fresh and in good condition if your dog has recently had surgery and in recovery so not yet ready for a full water bath. While they are a useful addition to the dog cupboard, you do need to exercise a level of caution when it comes to the ingredients you may find in a dry or waterless dog shampoo. The core ingredients of most dry dog shampoos – starch power and clay, or Fuller’s Earth – are what makes it so effective, but used too often or by applying too much can actually do harm to your pet’s skin and fur by absorbing too much oil and clogging the fur so follow the ‘how to use’ instructions carefully. If in any doubt you should also steer clear of products that don’t list all the ingredients but use terms such as ‘proprietary blends’ or ‘conditioners’ without explaining what these are. A shop-bought waterless dog shampoo is not your only ‘dry bath’ option for your dog, you can also opt to make your own! A DIY dry shampoo for dogs is surprisingly easy to make and is also cost-effective, plus if you are worried about the contents of a manufactured version, you can take full control over the ingredients you choose to use. Before you make your own, just ensure the ingredients are suitable for your own dog’s coat and skin, and always do a spot check first before going for a full-on dry shampoo session. Most of the ingredients you need are probably already in your store cupboard – a simple mix of baking soda (deodorizes) and corn starch (absorbs oil) is a good way to start. You can then tailor your DIY dry shampoo to any specific needs such as flea or odor control (essential oils such as lavender) – but always dilute. Then mix up in a shaker and off you go. Q: What Is Dry Dog Shampoo? A: A waterless shampoo for your dog is a power-based cleaner and freshener that doesn’t need water to work on your pet’s coat. You just apply the dry shampoo on to your dog’s fur and make sure it spreads well, using a towel to work it in if you need to. Then use a dog brush to remove the surplus dry shampoo and all the dirt it has absorbed. Used as an interim shampoo between full baths or grooming sessions, dry shampoos can help to remove surface dirt, absorb surplus oil and generally freshen up your pooch, to tide you over until the next time you can put him in the bath. Some are straight up surface dirt cleaners while others can also deodorize the fur and condition your dog’s skin and coat. Q: How Does Waterless Shampoo Work? A: Waterless shampoo is only intended to be as a freshen up and should never replace your dog’s regular bathing and grooming routine. But as a go-to for when you need a quick pooch spruce up or to quickly clean off a mucky pup, they are a great addition to your grooming kit. 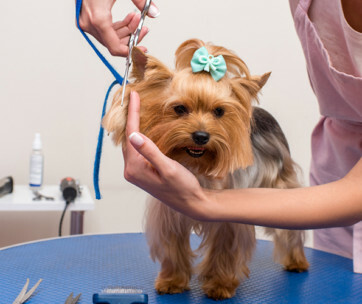 Just like his human, your pooch has sebaceous glands at the end of their hair follicles. On your pet, these glands are in larger numbers, especially near their paws, back of the neck, rump, chin and tail areas. Each gland secretes an oily substance called sebum, which is intended to keep your pet’s skin and coat, healthy, shiny and well-moisturized. It also has natural antibiotic properties and is the reason why your pooch has his distinctive ‘doggy’ smell. Between baths, this sebum can build up on your dog’s fur, leaving it greasy, dull and a little bit smelly. A dry shampoo for dogs works by sucking up any excess oil – as well as the dirt, bacteria and dust it attracts - that is sitting in your dog’s fur and can keep his coat looking good and smelling sweet between his regular full grooming session. Q: How Do I Use Dry Shampoo for Dogs? 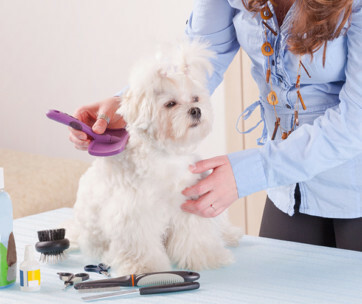 When the time is right, brush your dog’s coat to remove the powder and dirt (some dry shampoos don’t even require brushing, so check the pack). Q: Is Dry Shampoo Safe for Dogs? A: Follow the instructions on the packaging and don’t use your dry dog shampoo too often and it will be perfectly safe for your pet. The key things to look out for are not using too much of the dry powder in one sitting as it can dry out your pet’s natural sebum. Using too much waterless shampoo can also clog the hair follicles and prevent the sebum, which your dog’s coat still needs, to getting where it needs to be. Choosing the right product for your pet will also protect against allergies and skin irritations. And never see your dry shampoo sessions as a replacement for his regular bath as this could eventually store up a lot of problems for his coat and skin. 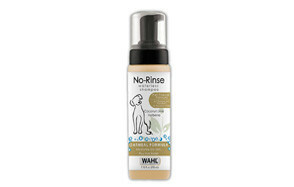 Wahl Natural Pet No-Rinse Waterless Shampoo scoops our best choice title thanks to its natural credentials, coupled with its impressive dry-cleaning power to keep your pooch sweet-smelling and his coat in tip-top condition. It’s easy to use too – just massage in and wipe away – treating your pet to a freshen up without drying out their skin. A great product to have with you, when you need to quickly clean up and go.